The right-wing Shiv Sena’s recent vigilante actions targeting Pakistani musicians, sportspeople, and diplomats in Mumbai have led to embarrassment and widespread condemnation in India, and of course to the right-wing in Pakistan gleefully pointing fingers at India. There have also been compassionate and creative responses from Pakistanis, who have all too often suffered the poison of bigotry and injection of religion into politics. 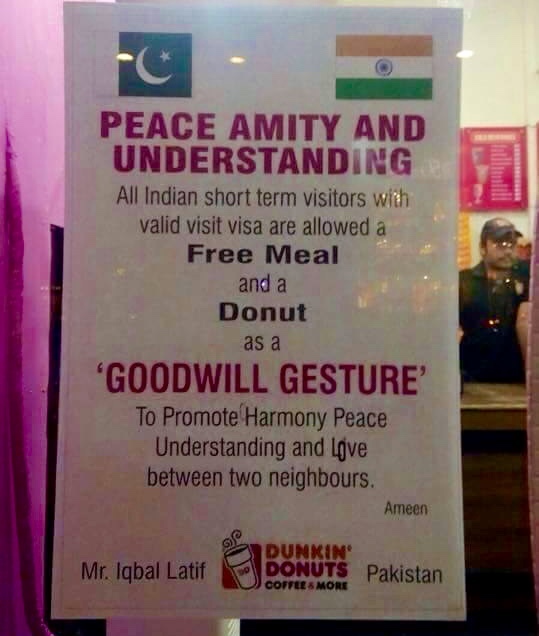 After a Pakistani family had to spend the night on the footpath in Mumbai because they lacked the requisite papers (Form C) allowing them to stay in a hotel, Pakistani entrepreneur Iqbal Latif responded by offering free meals to Indians visiting Pakistan at his Dunkin’ Donuts franchises. His gesture was widely reported and drew a massive response in India.